NEW FORMULA X-Treme is a genuine step forward in tubed tyre sealant performance – a real breakthrough product that fights bigger holes and even slits. Designed for the needs of off-road competitors and weekend riders, it is the difference between making it home and being left stranded by a ‘snake bite’/ pinch flat. It has been tested in the most demanding downhill, extreme and cross-country events and has been the difference between winners and losers. One 400 ml bottle will protect both a rider’s tyres, with enough to spare. Like OKO Puncture Free, it also works for full UST wheel/tyre tubeless set-ups in the case of those who will be putting their bikes through extreme tests. But we recommend you use OKO Magic Milk™ if you are using ‘tubeless ready’ tyres. 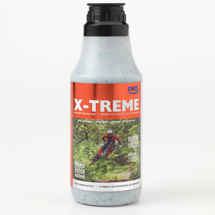 400 ml bottle deals with one bike: for 26” MTB or Cross Country tyres you now only need 160ml for ultimate protection. Simple fitting, using the valve core remover and filling tube supplied in every bottle cap. 25 litre drum is ideal for retailer and team service workshops: the NEW heavy-duty all-alloy drum pump is a one-time purchase and can be rinsed out again and again for repeated use in filling tyres rapidly. It uses the unique OKO Bike drum pump with adjustable dosage, plus it has Schrader and Presta valve fittings. WORKS WITH INNER TUBES and FULL UST TUBELESS WHEELS/TYRES, with Schrader or removable-type Presta valves. (‘Tubeless Ready’ tyres require rim tape, and OKO Magic Milk™ sealant: check the compatibility of your proposed rim and tyre combination before attempting). For maximum accuracy, for use with Presta valves, and for a host of workshop uses, use the OKO Tyre Sealant Injector. OKO X-Treme is designed primarily for off-road riding and is not recommended for high-speed on-road cycling: for all-purpose inner tube use, select OKO Puncture Free for Bikes.